- Hamilton was "bullied" into writing as she was told, "You are that unusual combination, a gifted talker and a gifted writer. To be a gifted talker can be fatal to a writer." - Mythology remains in print after six decades and is still used as an introductory text to mythology in high schools and colleges; a mark of its status is that study guides to the book exist. 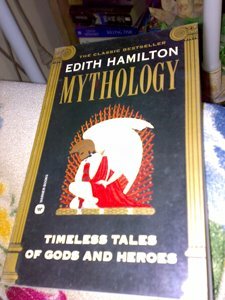 I never thought that an ancient account of Gods and Heroes will be as entertaining and a good read for younger generations until I read Edith Hamilton's Mythology. It was always my decision that I should only read about these mythologies when I am older so as I will be able to grasp everything about it. But when I tried to read the first paragraphs of this book my decision was torn away for I discovered that mythologies could also be a thing for youngster. Mythology is an anthology of Greek, Roman, and Norse mythology compiled from classical sources. The introduction to the text includes a commentary on the major contributing poets throughout history and the changing characterization of myth and deities as cultures have evolved. Since its publication, it has become one of the most read, powerful, and critically-acclaimed books of Western and Classical mythology, and is frequently used in colleges as an introductory text. It includes sections containing the stories of nearly all major mythological figures. Not including the introduction, the book contains seven sections. The first tells about the gods of Olympus and how the world came to be. The second part tells stories of love and adventure. It includes the tales of Cupid and Psyche and the Quest for the Golden Fleece. The third part details the stories of heroes before the Trojan War. It includes Perseus, Theseus, Hercules, and Atalanta. The fourth part tells the stories of the heroes of the Trojan War, including Odysseus and Aeneas. The fifth part tells about three famous families of mythology: The House of Atreus, The Royal House of Thebes, and The Royal House of Athens. The sixth part tells the less important Greek and Roman stories, and the seventh and final section tells the myths of the Norse. There are black and white illustrations throughout.